Eyesight impairment in the form of low vision and blindness affect approximately 285 million people worldwide. Of those, cataracts remain the leading cause of blindness for middle-to-low income countries. In the United States alone, 24.4 million cases of cataracts have been diagnosed—a 20% increase in the ten years from 2000 to 2010. Many people assume cataracts and poor eyesight are simply a negative side effect of growing older—and in some ways, they’re right. For those 285 million people with vision impairments, 65% are over 50 years old. In honor of World Sight Day — October 13th, 2016 — we’re doing our small part to bring awareness to the risks of developing cataracts, the warning signs, and ways you can protect your sight. With the exception of a family history rife with cataracts, we each have personal accountability in ensuring the health of our eyes. According to the International Agency for the Prevention of Blindness (IAPB), 80% of visual impairments are avoidable. Cataracts are no different—many cases are preventable. If you have any of the following risk factors, note that you’re more susceptible to developing cataracts in your lifetime. Take precautionary action to eliminate as many of the risks as possible. 1. Outside protection – Getting the right light can actually be good for your eyes. However, protecting your eyes from UVA and UVB light can be key to keeping your eyes in good shape. Not only can both of these ultraviolet rays contribute to the development of cataracts, UVB rays can lead to macular degeneration. Invest in a good pair of sunglasses that filter out both forms of UV light. But don’t stop there, getting outside and viewing the world both up close and far away strengthens the eyes. 2. Antioxidants – In addition to helping your body absorb that nasty UV light, antioxidants help stop damaged lens-fiber proteins from clumping—ultimately causing cataracts. Be sure to incorporate them into your diet daily for maximum rewards. Not only will your eyesight thank you in the years to come, but the rest of your body, too. 3. Omega-3s – According to a 2005 study, omega-3s inflammation fighting capabilities can also shield your eyes from cataract development. So be sure to get in some salmon, tuna, or other foods high in omega-3s on a regular basis. 4. Quit smoking – There are a long list of clinical studies that all say the same thing—smoking is directly linked to cataract development. As if the risk of lung cancer and other health issues isn’t reason enough to quit, you can add cataracts to the list. 5. Keep blood sugar low - Cataracts are strongly linked to diabetes. In addition, there’s actually a type of cataract known as a sugar cataract—which is found solely in diabetes patients. Sugar cataracts grow rapidly—some as quickly as three days. Blood sugar control will prevent this from happening and reduce your risk of any other form of cataract. 6. Fit in your workout – You wouldn’t think working out would have much to do with your eyesight, but it does. By keeping your body moving, your weight in check, and reducing your risks for obesity related diseases like diabetes—you’re well on your way to protecting your sight for years to come. 7. Regular eye exams – Getting regular eye exams will not only help keep your eyesight healthy, but it will give your doctor a baseline for your sight. They will also be able to not only test for cataracts, but let you know if anything unusual seems to be cropping up. Visiting your eye doctor once a year could save your sight. Even if you’re overall health is good, it’s still possible for your eyesight to degenerate. If you’re suspicious that you may be developing cataracts, review the following warning signs. Should any of these sound familiar, it’s time to get your eyesight tested and take appropriate action. When you’re first diagnosed with cataracts, stronger prescription glasses and bifocals may buy you some time. However, cataracts are degenerative, so when they interfere with daily life, surgery may be the only option left. The good news is cataract surgery is a very successful procedure. In fact, nine out of 10 people will regain excellent eyesight between 20/20 and 20/40. While your eyes heal, try Bausch and Lomb’s relatively new prescription eye drop called Prolensa. It’s a NSAID that helps reduce inflammation and eye pain after surgery. 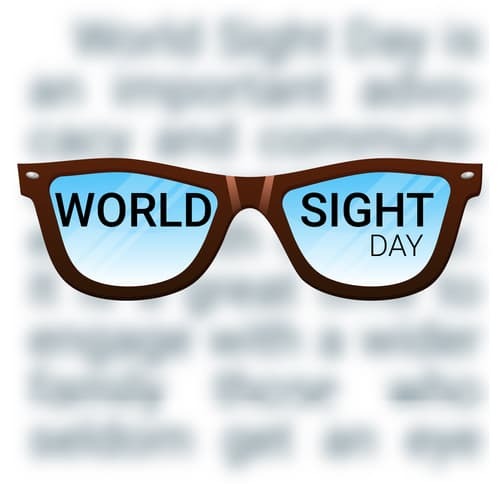 With World Sight Day just a few days away, taking a few moments to consider our eyesight health is a great way to commemorate the annual event. Bringing awareness and global attention to blindness and vision impairment is a commendable act. We hope you’ll consider your own risk factors when it comes to the possibility of developing cataracts. As well as taking any preventative action possible. Here’s to healthier vision—and a lifetime of healthy sight.